Even though Lasagne is an extremely popular dish, I just never tried making it. The first time that I made it was when a friend sent me some in return for some cookies I sent her (everyone should have friends like these). It was hands down, the best Lasagne ever since it incorporated all those things that I love. I have still made my own adaptions to my friends original recipe, with the addition of spice & garam masala but this can be omitted based on personal preference. 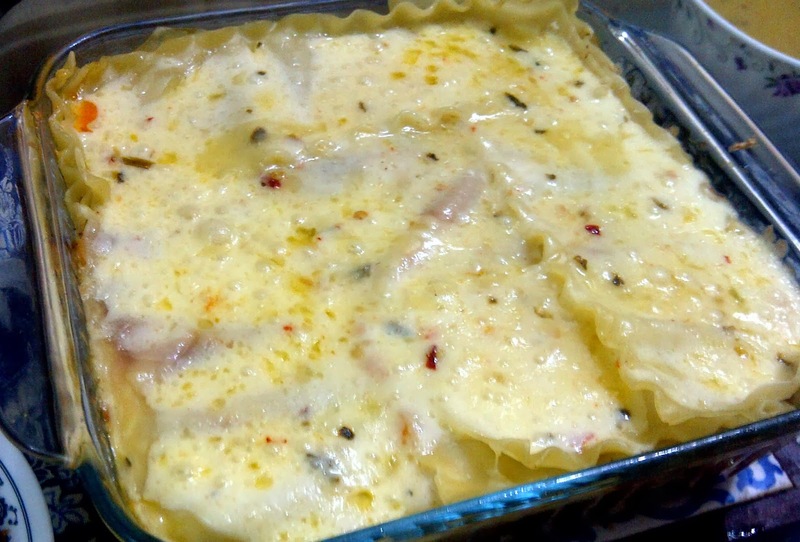 Please also note that this is a Desi version of lasagne, in actuality the white sauce layer is made with ricotta, but since ricotta is not easily available in Pakistan and is also expensive, properly seasoned white sauce provides a delicious alternative! Chicken Mince can be made by processing boneless chicken in a food processor. Sauté mushrooms in 1 tbsp oil and 1/2 tsp garlic paste. Add 1/2 tsp salt & 1/4 tsp red chilli flakes and saute for about 5 minutes till lightly browned. Take mushrooms out of the pan and set aside. Heat more oil in the same pan (about 2 tbsp) . Fry onions till slightly brown. Add sabit garam masala if using (one elaichi, 3 cloves, ½ piece cinnamon) & garlic paste & sauté for 1-2 minutes. Add meat and cook till meat changes color. Add sauted mushrooms, 1 tsp salt, 1/2 tsp black pepper, 1/2 ts chilli powder, tomato puree, and ketchup. Bring to a boil and let simmer for 30 mins or until cooked. Add dried oregano after turning the heat off. Remove the whole spices from the meat after meat has been cooked. Melt 4 tbsp butter and add flour. Whisk quickly for about 2 minutes making sure that it doesn't burn. Make sure the raw flour smell disappears. Add milk and keep whisking to make sure there are no lumps. Cook till thick. Add half a chicken cube, salt and pepper to taste, and cheddar cheese. In case white sauce gets thick or there’s only a little bit left, add more milk and whisk. Boil lasagna strips as per packet instructions. Take a glass pyrex square/rectangular baking dish. I personally used a 9 by 9 inch square one. Lightly oil the bottom of the dish and then spread the strips on it. Place meat sauce over the strips then the white sauce. Spread 2 tbsp of chilli sauce if using. Sprinkle with cheddar cheese & oregano then start on the second layer (strips, meat sauce & white sauce). End the layers with lasagne strips on top. Cover the top layer with white sauce, cheese & oregano. Bake till cheese melts & browns. 1. Reserve the best lasagne strips for the top and if there are any torn pieces, put them in the middle. 2. Cut with a sharp serrated piece to be able to cut square pieces showing all the layers.